HIPIMS is a magnetron sputtering technology devoted to produce thin film coatings with enhanced properties. The technology offers advantages such as enhanced ionization that gives rise to denser coatings, higher hardness values and smoother surfaces. 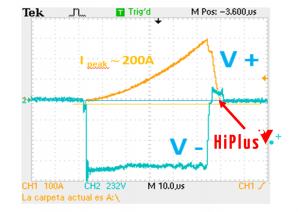 Studies of the role the HIPIMS discharge, as well as an added positive voltage reversal pulse right after the negative HIPIMS pulse, have proven a significant boost on coating properties and productivity in industrial applications. The instant advantage is that the magnetron surface will be immediately discharged, which will reduce the tendency to arcing. However, there are several other effects observed, such as enhanced high energetic positive ion bombardment towards the substrate. Measurements of the deposition rate, coating hardness and crystallinity have been performed for different metallic coatings (Ti, Al) as well as nitrides (TiN) and oxides (TiO2) deposited in reactive mode and more recently the effects that HIPIMS and positive voltage reversal plays on DLC coatings, in terms of adhesion as well as the functional layer.